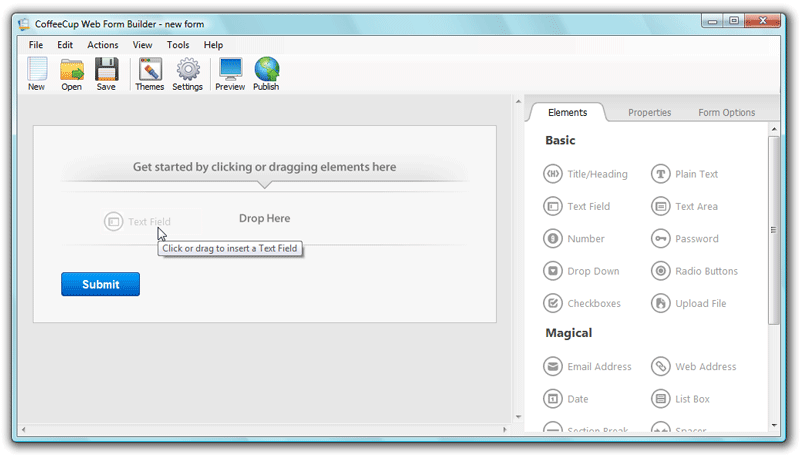 Web Form Builder brings you powerful forms created in a natural drag-and-drop workspace. With flexible layouts, instantly applied themes, and one-click publishing to the web, you can build the form you've always dreamed of in minutes. It works with CoffeeCup S-Drive straight from the box to serve up form results in an easy-on-the-eyes interface, so you don't have to configure a thing. Just design, publish, sit back, and watch what happens. ...... Just design, publish, sit back, and watch what happens. The form you've been dreaming of can be whipped up in seconds. Drag input fields and other form elements where you want them, then adjust text, labels, and options to your liking. Voila, your new web form has been born! Ready to spice up your form's style? Pick a design from the Theme Browser to apply it directly to your form, and choose another one at any time if you change your mind. You can always download more themes if you don't quite see the one that fits your style. Create a high quality and professional looking website. Qweas is providing links to CoffeeCup Web Form Builder 1.1.3166 as a courtesy, and makes no representations regarding CoffeeCup Web Form Builder or any other applications or any information related thereto. Any questions, complaints or claims regarding this application CoffeeCup Web Form Builder 1.1.3166 must be directed to the appropriate software vendor. You may click the publisher link of CoffeeCup Web Form Builder on the top of this page to get more details about the vendor.